The lighthouse was built in 1860 close to the warning beacon of the same name. The famous Battle of (cape) Trafalgar, that gave the name to the equally famous square in London, took place just in front of where this lighthouse now stands in 1805. 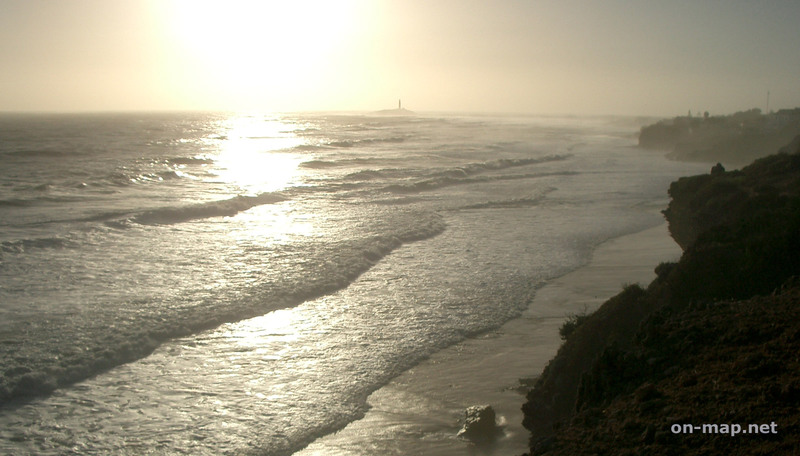 When coming from the direction of Cádiz, Conil de la Frontera or El Palmar, the road leading to the Trafalgar Lighthouse is just before entering los Caños de Meca. The Battle of Trafalgar took place on 21st October 1805 at the height of Cape Trafalgar. It was a sea battle fought between the British Royal Navy, commanded by Admiral Horatio Nelson, and the combined fleets of the French and Spanish Navy, under the command of Admiral Vileneuve. It was the last great sea battle fought during this period and around 5,000 lives and 15 vessels were lost (the latter was mainly due the storm that sunk many of the damaged ships the following day). The consequences of the battle far outlasted the Napoleonic wars.